In Book of Dead, all your bet settings are found in the grey button on the bottom right of the game screen. There start by setting the number of coins you want to bet per line, which ranges from 1 to 5, then set your coin value, which goes from just £0.01 to £1. Then select the number of lines you want to bet on, which is from 1 to all 10 of the paylines. This means minimum bet can be as low as just £0.01 per spin, while the maximum is at £50 per spin. You’ll also find more advanced features like Autoplay here, and there are lots of settings you can tweak to suit your playing style. Once everything’s set, you can go back to your game screen and start spinning by pressing on the Green button. The Scatter symbol is a Golden Book, the Book of Dead we presume. Spinning 5x Rich Wilde will get you 5,000x your line bet, and that’s the fixed jackpot prize in this game. Osiris is the next top prize and 5 of the golden man will get you 2,000x your bet. All in all, keep your eyes peeled for those Egyptian gods because they do pay well, even though Rich pays best! 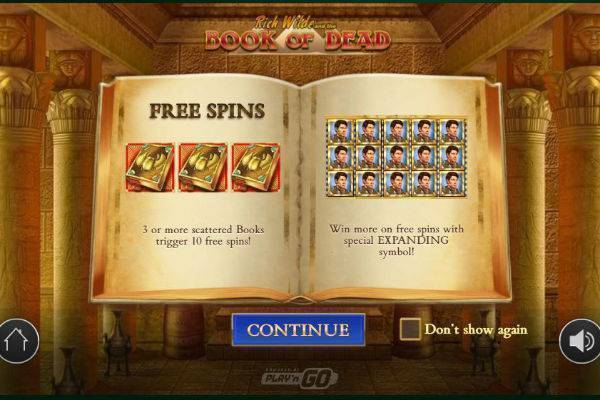 Book of Dead doesn’t have a lot of special features, but what it does have it does well and players love the Free Spins bonus game. Free Spins: When you spin 3 or more Scatters (the Golden Book), you will trigger the Free Spins bonus round. Here you’ll get 10 free spins, and during this round a symbol will be randomly selected to become an expanding symbol. As the symbol expands, your chances of winning increase dramatically! Gamble Feature: At the end of every win, the option to Gamble your wins will pop up to the left side of the screen. You can choose between guessing the colour of the card, or the suit of the card. Guessing the correct colour will multiply your win 2x, while the correct suit will multiply it 4x. 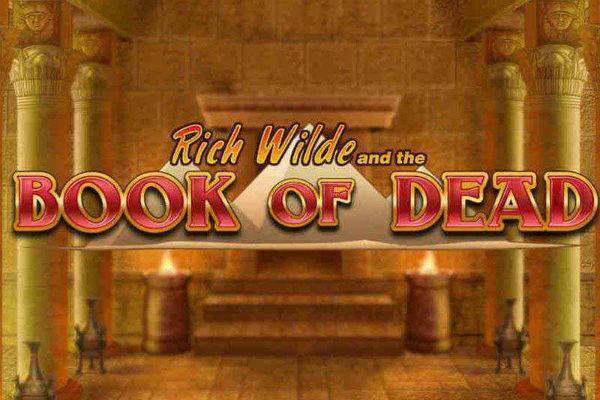 There are actually more than a few Egypt themed slots out there, but Book of Dead definitely stands out as one of the best with its sharp, colourful, graphics as you go through the golden tomb in your hunt for its treasures. The soundtrack is an upbeat one with a funky Oriental twist in the background to your fast spinning reels. Book of Dead is a popular slot for many experienced players. Of all the Egypt themed slots out there, this one stands out with its top graphics, animations and sound. But beyond eye candy, this game’s bonus features are also a catch: on top of free spins, there are expanding symbols that will increase your wins significantly. However, do go in knowing that Book of Dead is known to be a high volatility game, which means it can take more than a few spins before the goods start to roll in, so it’s best to pick up a casino bonus to pad up your bank roll before you start. Try Book of Dead for yourself at one of the casinos we recommend!